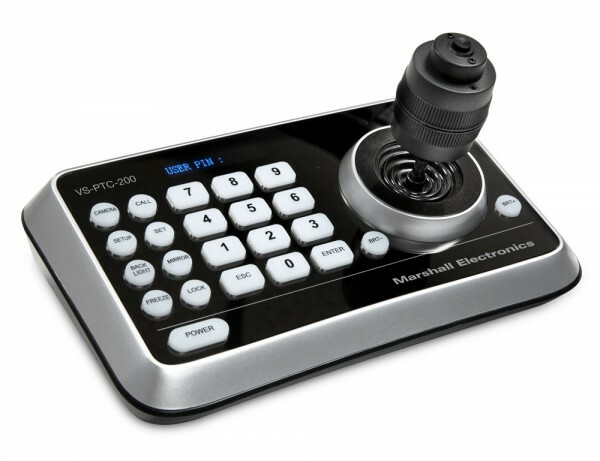 Product information "Marshall Joystick VS-PTC-200"
The VS-PTC-200 Compact PTZ Controller is designed and built to integrate seamlessly with Marshall CV620 Broadcast PTZ Cameras. This PTZ controller will operate Pan, Tilt, Zoom, and Focus simultaneously with the joystick as well as adjustment control over Brightness, Preset/Recall locations, Flip and Mirror, Backlight Compensation, Freeze Frame, Manual Focus and other adjustments on the keypad buttons. Related links to "Marshall Joystick VS-PTC-200"
Our comment on "Marshall Joystick VS-PTC-200"
Customer evaluation for "Marshall Joystick VS-PTC-200"